When it comes to maximizing comfort and protection from winter winds and snow, choosing the right jacket for the slopes is crucial. And if you're anything like me or my typical ski buddies, you'll need a jacket that'll keep you warm and happy for hours of chilly outdoor fun without making you sweat when you're working your way down challenging runs. As part of another season of the #ORinsightlab team, Outdoor Research provided me with a complimentary Women's Offchute Jacket to test. 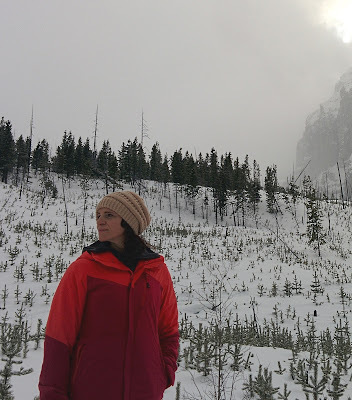 I took the Offchute out for winter hikes in Upstate New York, Alberta, and British Columbia, and for two solid days of beautiful skiing at Fernie Alpine Resort to see if it could function as my go-to winter jacket. The Offchute Jacket is primarily designed for ski resort use, but it combines a key feature typically only found in high-end ski jackets with other features most resort skiers are looking for - stretch. 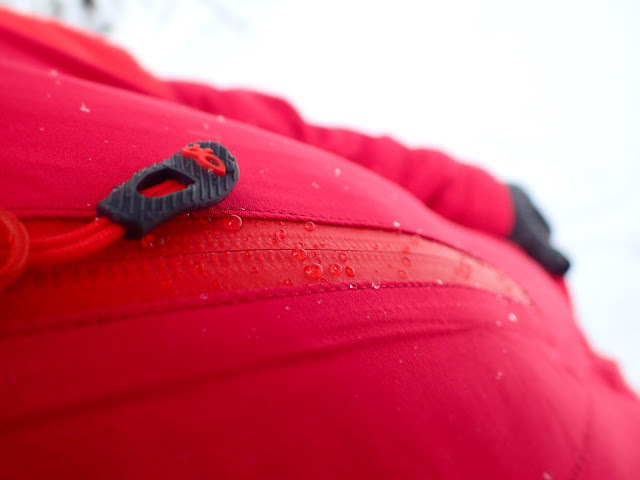 The Outdoor Research team constructed a waterproof, windproof, fully seam-taped ski jacket that also moves with the wearer, and that stretch isn't something most standard ski jackets have. The Offchute Jacket features 100% polyester synthetic insulation, but instead of using the same amount of insulation throughout, it varies. The front body of the jacket and the top of the sleeves have more insulation (80 g/m2) than the back body and under arms have (60 g/m2). Otherwise, the majority of the other attributes are standard, including a helmet-compatible hood, pit zips, a zip chest pocket and two zip hand pockets, and internal zip pocked, fixed powder skirt, hook and loop cuff closures, and an elastic drawcord hem. I tried out a medium in the Flame/Scarlet version of the Women's Offchute Jacket and found it fit true to size. The sleeves and body were long enough for my 5'9" frame, and there was enough room for a baselayer underneath. I didn't have enough room for more than one baselayer without feeling like the Michelin man, which means I'd likely leave the Offchute Jacket at home on the coldest skiing days. But I appreciated the fact that unless it was below 20ºF, I didn't really need another baselayer underneath. It's also just a good looking jacket thanks to the different colors of the Ventia™ 2L softshell fabric, but if plain black is more your style, that's an option as well. For me, the Offchute wore like a standard ski jacket that allowed for a more freedom of movement than average. It didn't feel too insulated, but also didn't feel overly insulated - a perfect balance. Being able to stretch, bend, and move, and have the jacket do the same was great. 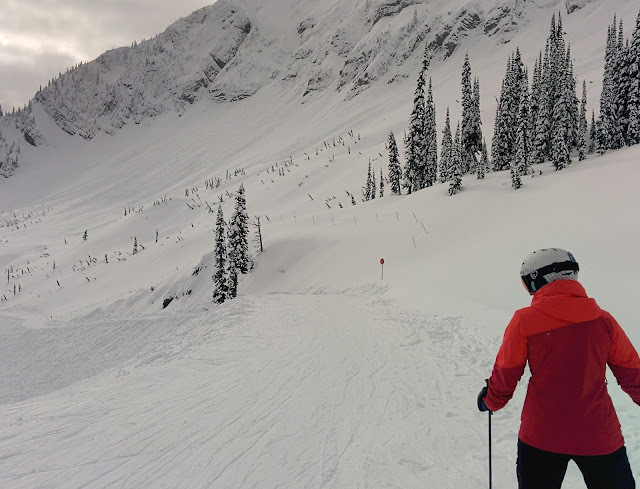 The windproof fabric did its job; I didn't feel wind through the sleeves or body of the jacket when I was skiing downhill, or when the wind picked up. I didn't feel any air through the front zipper. The waterproofing also did its job, but the non-water resistant front zipper jacket does need to be sealed with a storm flap to keep water completely out. The Offchute is puffy in the front thanks to the synthetic insulation, but I don't mind a little extra bulk if it keeps me warm enough. I was too warm when temperatures were in the 20-30ºF range and I was hiking uphill or skiing aggressively downhill, which meant the pit zips came in handy. 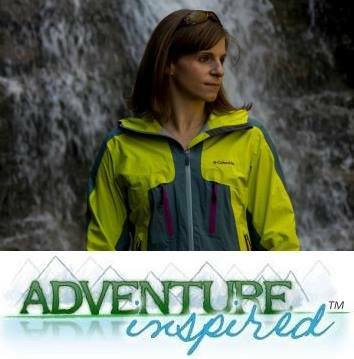 But when I was sitting on the chairlift, or standing still on our hikes, I was perfectly comfortable in the same temperature range with one baselayer underneath. A close-up of water beading up on the exterior of the jacket. The Offchute has a zippered exterior chest pocket and two standard zippered hand pockets, but I'd love to see a pocket on the sleeve. Chest pockets tend to be awkward to use for me, as a woman, and I'd rather use a pocket on the sleeve near my wrist for things like my lip balm and my ski pass. It's also close to sitting right on top of the internal zippered chest pocket, making it tough to put things in both of them at the same time. But I loved having an internal zippered pocket for valuable items. I found could fit my phone, camera, and spare gloves in the hand pockets without any trouble. and the cuff on the mittens is too narrow to fit over the sleeves. If you're the type who layers mittens over your sleeves and bought mittens accordingly, the sleeves will likely work perfectly. But if you're like me, you'll either need to struggle a bit to get the sleeves over your mittens, or get new mittens. Staring down the mountains in Kootenay National Park. 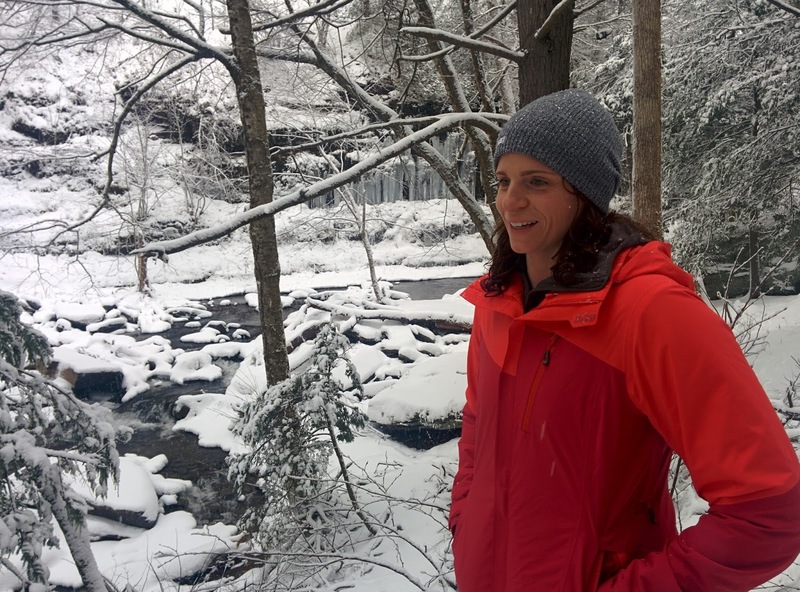 Overall, the Women's Offchute Jacket is just fine as a resort ski jacket, and I can see it being my go-to when temperatures are in the 10-20ºF range. If you run hot, the pit zips can help you manage your body temperature when you're active, and the insulation will keep you warm when you're not. It also worked out well as an insulated jacket for winter hiking, and versatility with pricey layering pieces is important. To make the jacket perfect, I'd ditch the exterior chest pocket in favor of a pocket on one of the sleeves, and make the powder skirt detachable. I've never found chest pockets comfortable to put things in, unless the jacket is extremely loose on me, and the powder skirt gets in the way when I'm not using it. 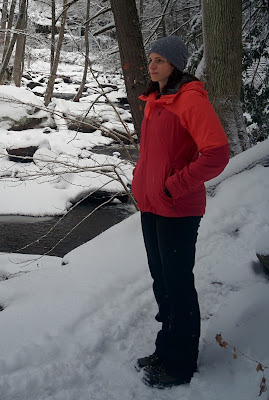 Though I received a complimentary jacket to test from Outdoor Research, all opinions expressed here are my own. What do you think, would the Offchute work for you as a ski jacket? What's your absolute favorite go-to ski jacket?